Most of you know Charlie as both a member and coach of CrossFit GVA. But what you may not know is how far she has come in her own CrossFit journey in recent years. Charlie recently gave us this fascinating insight into why and how she started CrossFit. I was about to turn 36 and enter into another year as an overweight woman. My daughter had started asking why I didn’t want to run and carry her, and more embarrassingly why I was bigger than the other moms. Something had to change, I had spent the whole of my adult life weighing between 110 -120kg and my health was on a downward path. I had tried gyms, exercise fads, many diets but nothing had stuck I would lose some but inevitably end up putting the weight back on. I needed something different and something that could change my lifestyle habits for good. Whilst looking on the internet for different ideas that could help, I came across CrossFit, what these people where doing with their bodies was just amazing, but I felt it was completely unachievable for someone like me, that is till I came across a CrossFit – Scaled WOD Demo video showing scaling in action, all the participants were doing the same workout. I was amazed everyone was working together yet at a level that worked for each individual. At that moment I decided I was going to give it a try, I signed up for a month’s trial. Now I’m not going to lie what followed next was probably one of the most hardest/painful months I’ve been through, not only had I gone from sedentary to 4 workouts a week, I also started measuring my food intake. This took its toll on my body, many evenings I was unable to move due to the muscular pain as well as the constant hunger pains I was feeling, but every time I walked into the CrossFit box I was treated to smiles and encouragement. How was your initial experience? At first I was terrified of joining the main classes, when workouts where put on the board I’d stare blankly at the coach with no idea what I was supposed to do, what piece of equipment I needed to grab, what weights to use, but with the help of my fellow crossfitters and the support of the coaches I soon began to pick up the movements. I also soon realised that no one was looking at my performance and judging me, they where supportive and encouraging at every turn, I didn’t need to hide at the back of the class and by concentrating on my own performance and form, results soon came. Each day I learnt something new or tried something different. What happened after the first month? I decided that if this was to truly work I had to commit, I signed up for a year’s membership. This was the start of the new me, not only did I start to lose weight I started to enjoy the physical and mental challenge of the workouts. At 4 months in my coach told me about the Open, I thought he was crazy asking me to compete in a worldwide competition but he eventually persuaded me and I’m so glad he did. I got through the Open, yes I was last in the box but worldwide I was not even in the bottom 40%, this was my aha moment, I was not only doing CrossFit but I was getting better and doing things that where impossible 4 months earlier. After 8 months I well and truly had the CrossFit bug, I started interning at the box trying to learn all I could as my passion grew. One year in and my coach said I was ready, I took and passed my CrossFit Level 1 trainers course. I started off shadowing my coach and teaching small classes. All while still working on my own fitness and constantly trying to improve my technique. 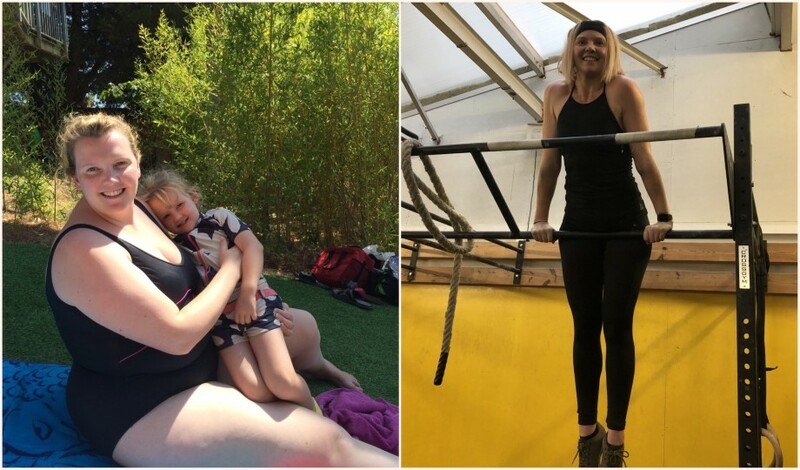 I’ve now been doing CrossFit for over 2 years, I’ve lost more than 40kg so far. I can now run, jump and throw my 6 year old around as if she weighs nothing. My quality of life has improved more than I ever could have imagined. I’ve learnt so much about myself not only physically but mentally. I’ve learnt to push myself, go out of my comfort zone and find the place where the magic happens. CrossFit is for everybody, no matter your age or state of fitness it can and will be scaled to your ability. All you have to do is commit to turning up to class regularly and giving your best each time, you can’t PR every class but you can give your best on the day, progress and fitness will happen.